The 2200 series can be arranged in any order depending on your needs. 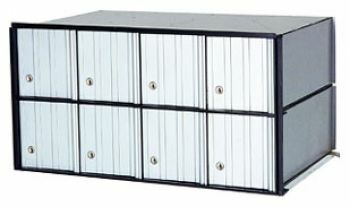 The HSS PO Box can be installed in traditional wallmount applications, HSS Industries' 101R Front Loading Enclosure, and the 101C Rear Loading Enclosure. Dimensions for the individual door sizes on this model are 5-1/2" W x 5-1/2" H. The overall dimensions are 23-1/4" W x 11-3/4" H x 15-1/2" D.